Before getting into jobless claims, let's review some vehicle sales reports. Because of the government shutdown, the motor vehicle sales reports from December and January were both released on Monday. This December report was solid, which helps Q4 GDP and the January report wasn’t. Meaning it hurt Q1 GDP estimates. The December report showed total vehicle sales were 17.5 million which was up from 16.6 million. Domestic vehicle sales were 13.5 million which was better than the previous 12.8 million. The January report was weak as total vehicle sales were 16.6 million which missed estimates for 17 million. Domestic vehicle sales fell to 12.8 million. Domestic light truck sales fell from 9.5 million to 8.8 million. Jobless Claims - This vehicle sales report spells bad news for consumer spending. To be clear, this report wasn’t a disaster. Ever since early 2014, total vehicle sales have been between the mid 16 million range and the mid 18 million range. We’d need to see further weakness in the next few months before I would get worried about this data point. On a theoretical basis, it’s interesting to contemplate how fewer reports affect the market. Some politicians have called for firms to report earnings twice per year instead of four times to eliminate short term thinking. That change probably won’t affect short term thinking because private firms can still do channel checks and measure results. Stocks still will trade every day. For firms with seasonal businesses, only a few months in the year matter anyway. In a more practical sense, when double reports come out, the most recent report is what matters. Essentially, when old reports show good news, the market missed out on the potential gains from them. Stocks were crashing in December, so some good reports could have helped the market stabilize. At this point in the quarter, I’m usually focused on the first revision to the initial GDP report. By the end of this month, I’d be onto the next quarter. However, this one is unique because the government shutdown delayed many data releases. As of February 6th, the CNBC rapid recap median estimate for Q4 GDP growth is 2.7%. That’s including 11 estimates. It makes little sense that stocks got as oversold in December as they did in October 2008. Growth has slowed modestly, but 2018 was still a great economic year. We aren’t in a financial crisis and never came close to being in one. 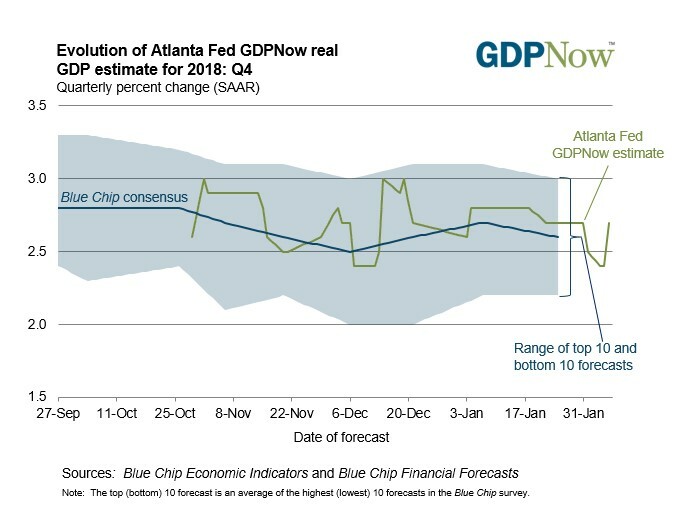 The first estimate from the Atlanta Fed Nowcast for Q1 won’t be released until Q4’s GDP report comes out on February 28th. This time we won’t get the ridiculous estimate that often occurs at the start of the quarter because it’s based on little data. The first estimate will have one month of hard data to work with if the government doesn’t shut down again. If it is shutdown, the Q4 GDP report still won’t be released. As you can see from the chart below, the Atlanta Fed’s Nowcast estimate increased from 2.5% to 2.7% on February 6th. This quarter has seen relatively steady estimates as the Nowcast has been between 2.4% and 3%. The Nowcast estimate increased to 2.7% because the contribution of net exports to Q4 GDP increased from -0.52% to -0.23% because of the international trade report. Once again, I will reiterate that Q4 GDP growth will be between 2.3% and 2.8% and we still don’t have a good idea what Q1 GDP growth will be. There have only been soft data reports from January and estimates of the negative effect the government shutdown had on growth. It’s no surprise jobless claims fell in the week of February 2nd. Usually, extremely large spikes like in the previous report don’t hold up. Jobless claims fell from 253,000 to 234,000. Some view this as a negative report because it missed expectations for 223,000. And also because the 4 week average, seen in the chart below, increased from 220,250 to 224,750. While the 4 week average is pivotal to follow, I don’t think a slight increase is cause for alarm. When the 200,000 reading comes out of the 4 week average, it will pop much more. This was the first set of back to back weeks were claims were at least 10,000 above estimates since March 2017. It’s fair to point out that this report has been affected by the government shutdown which made it less predictable. Specifically, claims by federal workers were 6,700 in this report which was down more than 8,000 from the prior week. 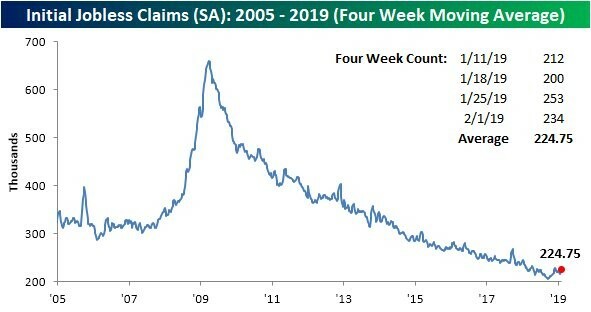 Jobless Claims - This makes the decline in claims this week less impressive. Another negative point about this report is the 4 week average of claims hasn’t fallen to a new low in 21 weeks which is the longest streak since April 2016. That doesn’t concern me because economic growth was starting to improve in mid-2016. I wouldn’t be surprised if the current cycle low in the 4 week average is the ultimate low. That doesn’t mean a recession is coming soon. It’s statistically impossible for claims to fall indefinitely. I’d be happy if they stayed at these levels even though that’s terrible in rate of change terms. Specifically, the 4 week average of claims was down 1.4% year over year in this latest report. The 4 week average was up 7.8% in September 2017 and that didn’t signal a recession was coming. Both the January motor vehicle sales and jobless claims reports caused some investors to worry. At most, they signal an economic slowdown. However, other positive reports counter that argument. The fact that stocks fell 20% from peak to trough late last year is shocking given the estimates for 2.7% GDP growth. Investors saw the hawkish Fed and global developed world slowdown and sold stocks without asking questions about the American economy. You shouldn’t sell U.S. stocks exclusively because Europe, Japan, and China are seeing weakness.